I decided, for the first time, to do a necklace for the monthly charity piece. 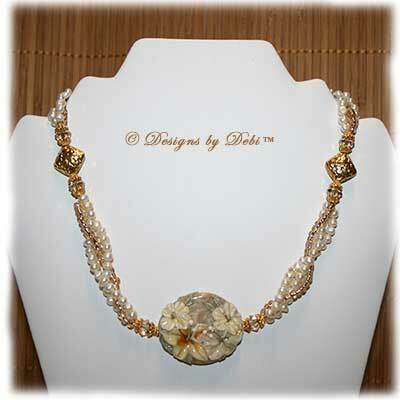 The centerpiece of the necklace is a gorgeous hibiscus focal in shades of cream, pale yellow, beige and topaz handmade by Susan Elliot of Doodletart Glass. 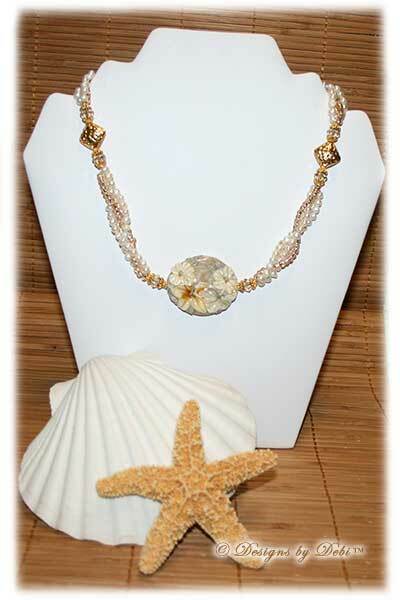 To accent the colors of this amazing bead, I used Swarovski Crystal Golden Shadow bicones and twisted lengths of white freshwater pearls and shimmery, creamy golden seed beads. 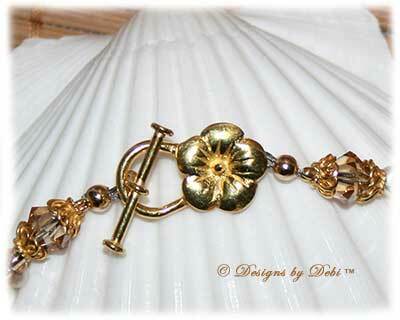 I opted for gold beads and findings and used some beautiful gold vermeil embossed floral diamond-shaped pillow beads handmade by metalsmiths in Bali, Indonesia, gold vermeil swirled bead caps and a gold vermeil hibiscus toggle clasp. The charity I've chosen to receive the donation from this month's piece is Friends of Keri. Keri (McDuff) Bosworth was a high school friend of mine. Last summer, on June 26th, Keri slipped, fell into a swimming pool and broke her neck. She was airlifted to Beth Israel Hospital in Boston and underwent hours of surgery. Luckily, she did not sever her spinal cord. But she did end up paralyzed from the chest down with only limited movement of her shoulders and arms. Keri spent weeks in the hospital and subsequently many more weeks at Spaulding Rehabilitation Hospital in Boston. Life changed fast for Keri, her husband, Kevin, and their 2 children, Kyle and Paige. Keri needs nursing care, physical therapy, a specially equipped van to get to rehab and their house has had to be outfitted with ramps and other equipment necessary for Keri to function. 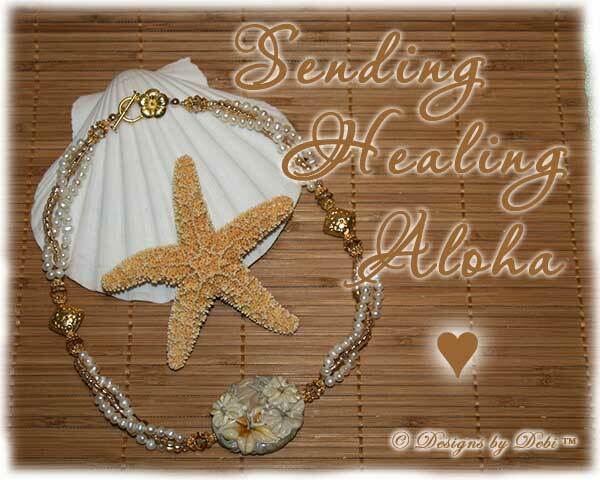 As you can imagine, the medical bills and cost of converting their house are enormous. Keri's Friends have been holding fundraisers and doing other things to try to help. I decided that Friends of Keri would be my chosen charity for this month. 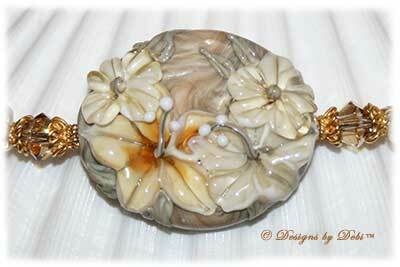 I designed the necklace in shades of cream because that is the color for Spinal Cord Injury Awareness. All the money raised by Friends of Keri goes directly to Keri and her family. The necklace measures 18 1/4 inches from end to end.